Above: UCSC assistant professor of sociology Lindsey Dillon addresses the room of volunteers during a daylong DataRescue event held at the Berkeley Institute for Data Science at UC Berkeley. The event focused on archiving pages from the websites of the DOE National Laboratories and NASA Earth Science. Credit, all photographs: ©Jamie Lyons, with permission. Following the 2016 presidential election, what started as a flurry of emails between academic colleagues launched a new watchdog for science and the environment: an online activist network called the Environmental Data and Governance Initiative (EDGI, pronounced “edgy”). Troubled by the incoming administration’s anti–climate change stance, the group of scholar activists, including UC Santa Cruz sociologist Lindsey Dillon, coordinated teams of volunteers to pre-emptively copy government websites. Anticipating the potential loss of years of environmental research, this systematic rescue of federal data occurred at 49 events in 2017 and helped build a comprehensive archive of federal websites and data. It also sparked hundreds of media mentions of the work, including a bit on The Daily Show. Dillon, who had just begun her first year as a UCSC assistant professor, took on the role of co-chairing EDGI’s 11-member steering committee. Following the inauguration—in between the Women’s March and airport protests—she helped coordinate a data archiving event in the San Francisco Bay Area with 170 volunteers. She also became deeply involved in EDGI collaborative research that has generated three comprehensive reports to date. For the first, the group interviewed more than 60 former and current OSHA and EPA employees, some of whom had worked at these agencies since the 1970s. The resulting The EPA Under Siege compares the threat in the current situation to that in the Reagan years. The second report, Pursuing a Toxic Agenda, reveals how the new administration’s environmental policy changes disproportionately affect vulnerable communities that are already marginalized. 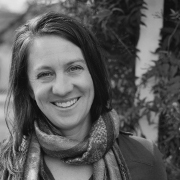 The topic dovetails with Dillon’s own primary research into the environmental politics of San Francisco’s Bayview–Hunters Point neighborhood. Unlike history preserved through physical media like newspapers and books, virtual history is intrinsically ephemeral, potentially vanishing with the tap of a delete key. To preserve this rich digital history, the Internet Archive, headquartered in San Francisco, has archived billions of web pages since 1996. Their digital library collection occupies more than 30 petabytes (1 PB=1 million GB) of server space, with multiple copies saved in other cities around the globe. Their web crawler tool, the Wayback Machine, captures snapshots of websites, allowing anyone to view a website’s history. Although federal websites often change when a new president takes office, this time the very real threat of rapidly losing access to valuable environmental data inspired activists to first gather in Toronto, then throughout the U.S. Coders at these “archive-a-thons” first designated important URLs (web addresses) for the Internet Archive to capture, such as the EPA climate change pages, to guide web crawlers beyond the first few links of a web page. Anyone can nominate web pages for archiving, but EDGI developed a web tool to make that easier, as well as a toolkit for anyone wanting to host a DataRescue event. They also worked to archive uncrawlable pages containing complicated or dynamic data, like maps of greenhouse gases or marine protected areas. In total, the organized data rallies nominated more than 100,000 new web pages or datasets—a major contribution to a pre-existing project that had aimed to archive all federal websites by the time President Obama left office. Federal records law prohibits unannounced destruction of government information. Once removed from public access or taken offline, this information must remain stored and available through public requests via the Freedom of Information Act. But you have to know what information you are looking for to know if it vanished, said Dillon, and the process to track down that information can be convoluted. Take, for instance, one case involving major website facelifts to the EPA’s climate action plans for cities. Although the EPA relocated the original pages to an accessible online archive, the archive is incomplete, ending in broken links. Changes like this are not necessarily deliberate. In some cases, agencies have rewritten climate science pages to escape defunding, so EDGI did not want to alarm people unnecessarily. “There was so much going on, it’s easy to think website changes were a conspiracy. We didn’t want to play into that,” Dillon said. 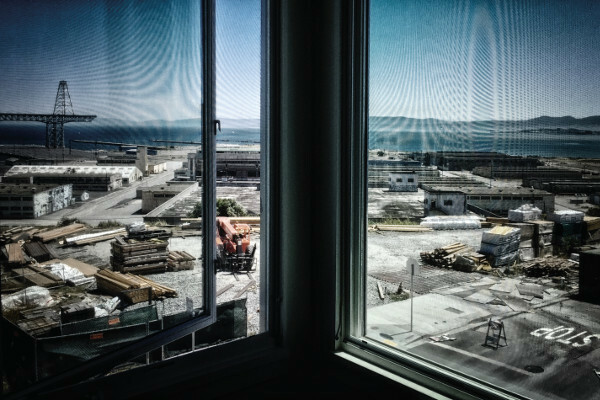 A newly constructed condominium looks out over the Hunters Point Naval Shipyard, where workers decontaminated ships from nuclear weapons testing and disposed of radioactive waste on site. This industrial area of southeastern San Francisco, the focus of Dillon’s primary research, has also housed a power plant, sewage treatment plant, and waste transfer station, and is now vulnerable to storm surge and sea-level rise. EDGI continuously monitors tens of thousands of web pages, but thus far has only identified “socially meaningful” changes, leaving deeper contextual analysis and probing to journalists. Their third report, Changing the Digital Climate, details how words like “climate change” and “greenhouse gases” have been replaced with less clear language. Links to raw data have also been removed, essentially limiting access, but the group found no evidence that any of this valuable resource has been deleted. “I’d love to attribute that to the work we are doing, the spotlight we put on,” said Dillon. 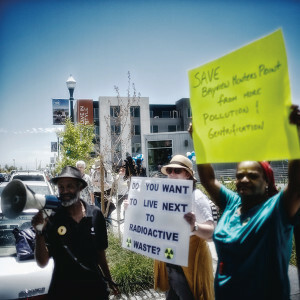 In July 2017, a protest against pollution and gentrification took place in front of the housing office for the San Francisco Shipyard, an upscale housing development being built on the former site of the Hunters Point Naval Shipyard. Developers have now begun to breathe new life into Hunters Point, but not without protest and controversy over the cleanup. With Bay Area real estate at a premium, the area has started to gentrify, increasing housing costs and further disenfranchising long-time residents. Dillon advocates that such “urban greening” projects should incorporate policies for equitable housing and environmental planning. Her book-in-progress uses Hunters Point as a model to examine the political ecologies of toxic cleanup and urban redevelopment.